A great science game for the Leapster system! This game not only will help turn your child into a "genius" about many kinds of animals, but the product itself is pure genius. It is rare to discover a game that makes learning science so much fun. This software works so well because it combines a fun quest of winning 25 animals with innovative science games that kids will want to play. The object is to populate five habitats -- Grasslands, Artic, Rainforest, Woodlands, and Ocean -- with five animals each. To win the animals, kids must play four games to win points. Some animals cost as little as 10 points, while others may cost as much as 50. Because kids can only earn a maximum of three points for each game played, they must play lots of games to earn enough points to win an animal. 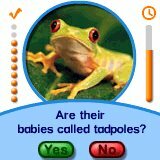 What's more, they also must correctly answer 10 questions about the desired animal in a limited amount of time. Animal Genius is successful because the four games that kids play repeatedly are intriguing. The games play on kids' natural affinity for mazes, "I Spy"-type games, and hidden-pictures activities. For example, in the game called "Scratch & See," kids use the Leapster stylus to scratch across a black screen to reveal a hidden animal underneath. But the game won't let them wipe away all the black -- only part of it. Kids have to use their powers of deduction and what they know about animal characteristics to see if they can correctly identify the partially hidden animal from a list. 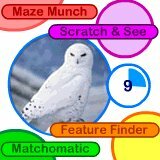 In the game called "Maze Munch", kids learn about the food chain while navigating a maze. Kids become one of nine different animals as they move through the maze to collect food, all the while avoiding becoming food to another predator. For example, in one maze, kids might play as an anteater. They direct the anteater toward the ants (represented as dots) while avoiding the moving jaguar who is trying to "catch" them. Music, interesting voices, and wacky facts help to sustain kids' interest. But the real hook is the use of photorealistic material along with animations. When kids are learning about an animal -- a snowy owl, for instance -- they view both photographs and videos of the bird. And when they win the owl, they place it in an Artic environment that looks like a photo of a real place. For added interest, the software also randomly triggers an "Animal Alert" which sends players scrambling through each of the habitats to find an animal that has wandered into the wrong habitat. Animal Genius can be enjoyed by both non-readers and kids who are reading. Parents will appreciate the voice-overs that identify all animals and words.